“Venturing beyond the utilitarian and defensive [fashion and architecture] are capable of expressing identity and power. They may define the ‘personality’ of their ‘user’- becoming a uniform, brand and ‘icon’” (Cargo Collective). Inspired by this, we’ve explored flagship stores around the world to identify the personalities of iconic fashion brands, in international locations. Founded in 1856, Burberry as a brand is a quintessentially British institution, celebrated for its outerwear designs and the ‘Burberry Trench’. Recognisable by their trademark check and Prorsum knight, Burberry is a business-savvy brand that appeals to the luxury global market. Acknowledged for its pioneering digital luxury positioning, Burberry is an ever-evolving brand dedicated to maintaining cultural relevance whilst projecting their iconic status. Burberry’s London store is a space where the digital world meets the physical, a place where you can try on clothes in front of a mirror that transforms into a screen to see what it looks like in full-flow on the catwalk. Their flagship London store sits in pride of place on Regent Street and while modern and digital inside, the exterior facade is representative of grandiose traditional British stonework architecture. Dior, launched by French couturier Christian Dior in 1947, is founded on principles of glamour, elegance and prestige, catering to a refined consumer. The monochromatic flagship store on the Avenue Montaigne, Paris, perfectly complements Dior’s elegance of design. During the Galliano era, the brand took a more flashy and colourful vibe to suit today’s nouveau riche. Now under the guidance of Raf Simons, designs from the house of Dior are predicted to meet with Simons’ signature precise, incisive, rigorous, architectural style to reconnect with the tailored spirit of Christian Dior’s original collections. Paul Smith collections demonstrate classic British tailoring but are characterized by quirky and unexpected details that portray Sir Paul Smith’s genuine sense of humour. Smith, still an integral part of the company as designer and CEO, influences branding and design and his stores reflect the character of his collections. 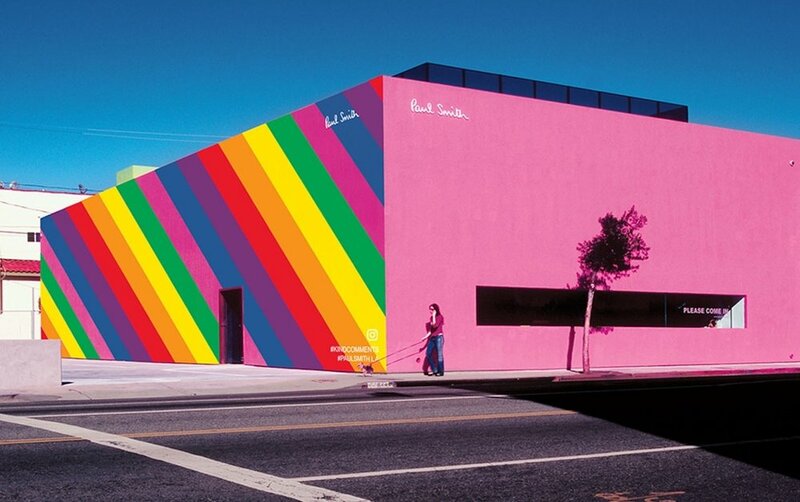 Every store is totally original but it’s the shocking pink building with movie-set styling on Melrose Avenue, LA, that really catches our eye. Famed for its ‘little black dress’, Chanel has a long-standing tradition with guiding the fashions of an era. Specialising in both haute couture and prêt-à-porter, designs from Coco Chanel are considered to be simple but elegant; replacing the opulent, over-designed, constrictive clothing of the 19th-century. Masculine and monochrome palettes are selected to denote the boldness of the female character, and the brand is recognised for introducing alternative fabrics to provide texture and structure to their garments. Chanel’s flagship store in LA reflects the monochromatic clean lines of their designs, whilst fitting into the swanky neighbourhood of Rodeo Drive. Japanese architect, Jun Aoki, has designed many of the Louis Vuitton stores in Japan, New York and Hong Kong. Responsible for the original 2005 design of the Louis Vuitton Hong Kong Landmark, Aoki redesigned the building with a show-stopping glass façade in 2017. Situated on one of the busiest junctions in Hong Kong, well-heeled shoppers flock to the store that represents a unique, iconic destination in the world of Asian luxury shopping. Aoki also designed the Louis Vuitton store in Tokyo (see below). It is inspired by the history of the Ginza district, where is it located. 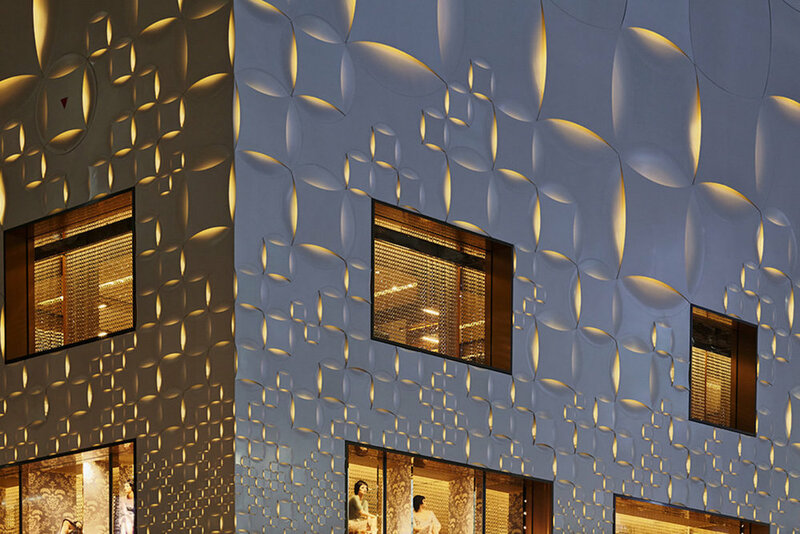 The façade also reflects the brand with a patterned and perforated shell based on their iconic monogram. - Share the best of fashion and architecture using the social icons at the bottoms of this article.